Buonarotti was born March 6, 1475, in the small Tuscan town of Caprese in the mountains east of Florence where his father was serving in a Florentine provincial post. The family soon returned to Florence where they lived just one block from Santa Croce, the great Franciscan church of Florence. It was in that church that young MIchelangelo learned to draw. He crouched on the stone floor of the Bardi chapel, and copied the frescoes of Giotto. We still have those first drawings that are the beginning of one of the most extraordinary careers in the history of art. Michelangelo and his family living in Florence on Via dell'Anguillara. Family lives in building that is still there at the corner with Via Bentaccordi. Michelangelo's mother Francesca dies.Soon will have step-mother. 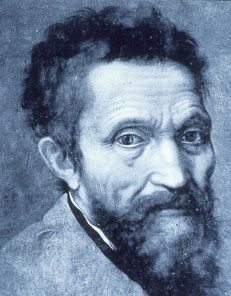 Michelangelo's father enters him into one of the grammar schools within the Santa Croce quarter to study Latin and other subjects. Michelangelo's father remarries a woman from a prosperous family named Lucrezia delgi Ubaldini. Michelangelo's father formally enscribes him in the bottega (art studio) of Ghirlandaio and M. works with Ghirlandaio at Santa Maria Novella on the frescoes of the Tornabuoni Chapel around the main altar. Michelangelo taken to Medici sculpture garden, near the monastery of San Marco and meets Lorenzo de' Medici who adores him and invites him into the Medici Palace with the consent of M's father. In April Michelangelo's patron and friend Lorenzo de' Medici dies and plunges both the Medici family and all of Florence into mourning. Michelangelo receives the commission. Begins work on the Pietá for St. Peter's. St Peter's Pietá is complete. Installed in chapel in time for Holy Year Jubilee. In Florence a commission of artists is formed to decide where Michelangelo's giant marble sculpture should stand with the final decision going to the Piazza della Signoria in front of the palace of government. In March, Pope Julius II dies; election for his successor chooses Giovanni de' Medici, now Pope Leo X, Michelangelo's childhood friend from the Palazzo Medici in the early 1490's when M. was living with the Medici family. The terrible Sack of Rome by foreign troops, many from Germany; Michelangelo is in Florence; the Sack temporarily destroys the Pope's power and the Medici are thrown out of Florence. M. stays and joins the republican resistance that lasts three years. M. is put in charge of fortifications a very important post. He is in great danger since he is seen as Medici friend and has enemies in and out of the Medici circle. Michelangelo's great friendship with the brilliant Vittoria Colonna.Roman literary figure. The death of Antonio da Sangallo the architect of St Peter's creates crisis and Pope Paul comes to 71 year old Michelangelo and asks him to take over, a commission Michelangelo accepts with the provision that he will have total control; he gets it-power over greatest architectural project in all of Europe. A new Pope reappoints Micheangelo as the chief architect for Saint Peter's and M. now begins the design and construction of the dome with Brunelleschi in mind. On the 18th of February, after a very brief illness Michelangelo dies in his house in Rome surrounded by close friends; his nephew Leonardo and Florentine friends sneak his body out of Rome knowing that the papacy will try to bury him in Rome; his body is brought to Florence to the convent of San Pier Maggiore just up the street from his apartment where he lived as child and he is buried in Santa Croce within sight of his childhood home on Via dell'Anguillara.